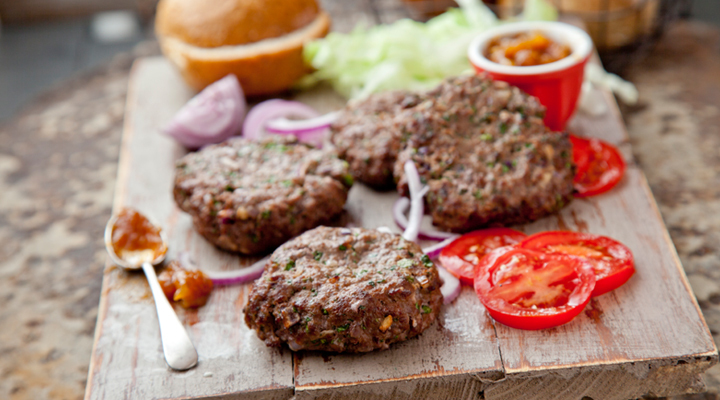 Lamb burgers are a wonderful alternative to beef burgers and are incredibly easy to make. They can be served with homemade oven-baked sweet potato wedges or with a delicious homemade hummus. Preheat the oven to 190oC/gas mark 5. Lightly grease a baking tray with olive oil. Beat the egg with the garlic, tomato purée, mustard, oregano and some salt and pepper. Place the lamb mince and chopped shallots in a large bowl, then pour in the beaten egg mixture. Mix well using your hands, then form into four burgers. Place the burgers on the greased baking tray and cook in the oven for 20 to 30 minutes, depending on how well you like your burgers done. Tip: Make a yogurt mint sauce by combining some Greek yogurt, a squeeze of lemon juice, some crushed garlic and chopped fresh mint leaves to add a delicious flavour to your lamb burgers. Easy to make and stayed together in oven!thanks.